Mortenson Construction has released a new study that examines wind turbine longevity, operations and maintenance (O&M) challenges, and strategies that could help extend turbine lifespans up to 40 years. Wind industry professionals identified strategies that can help extend turbine life and reduce ongoing O&M costs in a new study by Mortenson Construction. "We want to find ways to increase durability and longevity across the board to keep systems and wind farms operating, and to help owners increase their profitability," said Todd Bell, services executive at Mortenson. Wind turbines are the workhorses of clean energy. Exposed to all Mother Nature has to offer, they produce power under nearly all conditions and are a vital component of the U.S. electrical infrastructure. However, like other machines, wind turbines won’t last forever. 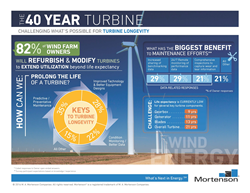 Mortenson Construction, a national leader in wind energy, has released a new study that examines turbine longevity, operations and maintenance (O&M) challenges, and strategies that could help extend turbine lifespans up to 40 years from a 20 to 25 year design life. According to the U.S. Energy Information Administration, wind made up 4.7 percent of total U.S. electricity generation in 2015. As more wind farms are brought on line, operations and maintenance strategies are growing in importance to ensure high availability and to capture the largest return on investment. The modern era of wind power began in the late 1990s when larger-scale turbines (1.5MW) started being installed. Since that time, hundreds of wind farms have been built and thousands of turbines have been energized with some now exceeding 3MW in capacity. Turbine lifespans are typically designed to last approximately 20 to 25 years with several key components actually lasting 9 to 13 years, so owners and operators increasingly will be faced with the decision of whether to refurbish and modify turbines to extend utilization beyond current life expectancy. The study examines operations and maintenance activities, strategies to prolong turbine life and reduce ongoing O&M costs, and challenges the industry on whether a 40-year turbine is an attainable goal. Mortenson spoke to industry professionals at the 2016 AWEA Wind Project O&M and Safety Conference to better understand these issues and the impact on design and construction trends. Mortenson is recognized as one of North America’s principal full-service wind power contractors and energy services providers, and has constructed more than 150 utility-scale wind energy projects. The study is available at mortenson.com/wind2016.